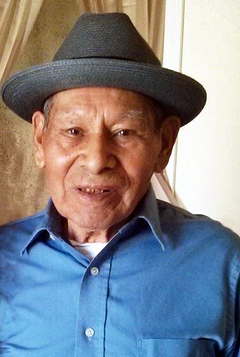 Prayer service for Juan Garcia 89, of Lubbock will be held 6:00 P.M. Sunday, October 21, 2018 at Calvillo Funeral Home Chapel. Services will be celebrated for Mr. Garcia at 10:00 A.M., Monday, October 22, 2018 at Calvillo Funeral Home Chapel with Rev. Johnny Perez officiating. Burial will follow at Peaceful Gardens Memorial Park under the direction of Calvillo Funeral Home. Juan was born May 27, 1929 in Brownsville to Virginia Garcia, he passed away on October 14, 2018 in Houston. A lifelong resident of Lubbock, he had many interests one of them being music and an accomplished accordion player. He was a giving person and worked hard all his life to provide for his family. Juan also was a collector of hats and had one for every season of the year. He is preceded in death by his wife Micaela Garcia (1989) and a son Alfonso Garcia. Survivors include his sons; Samuel Ramirez of Humble, Texas, Joel Garcia and Hector Garcia both of Longmont Colorado and Juan Garcia Jr. of Lubbock; daughters Virginia Villela of Cibolo, Elvira Salazar of Houston, Irma Rosales of Lubbock and Norma Saucedo of Sealy, Texas; twenty-four grandchildren and a host of Great grandchildren and Great great-grandchildren.